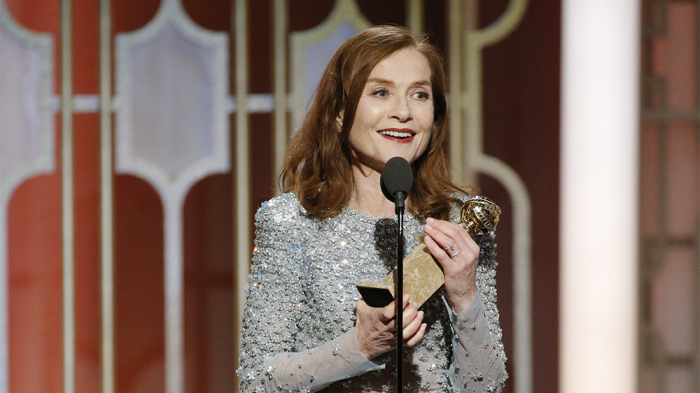 Isabelle Huppert is set to return to the Golden Globe stage, this time as a presenter. Huppert won Best Actress – Drama last year for Elle and then was Oscar-nominated. Emma Stone went on to win the Academy Award. Aaron Taylor-Johnson, who was a surprise winner in Supporting Actor here last year for Nocturnal Animals, will also be presenting. No word on if Casey Affleck will be returning to this, or any, awards stage to present the Best Actress prizes this season. Also set for presenting at the 75th Golden Globe awards will be Golden Globe winner, Kerry Washington, Seth Rogen, Golden Globe winner J.K. Simmons, Edgar Ramírez, Golden Globe winner Sharon Stone, Golden Globe winner Amy Poehler, Ricky Martin, Chris Hemsworth, Greta Gerwig, Golden Globe winner Halle Berry, Kelly Clarkson, Darren Criss, Penélope Cruz, Gal Gadot, Hugh Grant, Neil Patrick Harris, Christina Hendricks, six-time Golden Globe and Cecil B. DeMille winner Shirley MacLaine, Golden Globe winner Sarah Jessica Parker, and Alicia Vikander. This year’s Golden Globes will be the first major awards show since the avalanche of sexual assault and harassment that rocked Hollywood this fall and winter. There is currently a push for actresses to wear only black as a sign of solidarity with women (and men) who have come forward with their stories. Dwayne Johnson also suggested men do the same. The 75th Annual Golden Globe Awards will air live from the Beverly Hilton on January 7, 2018 at 8pm ET/5pm PT on NBC. Seth Meyers will host the ceremony. For a list of the nominations for Motion Pictures go here and for Television go here. Next 2018 Oscars: Can you get an acting Oscar nomination with no precursors?